When first-rounder Addison Russell saw he was getting a call from a number with a Georgia area code late Monday night, he nearly didn't pick up. Now he's glad he did. When the No. 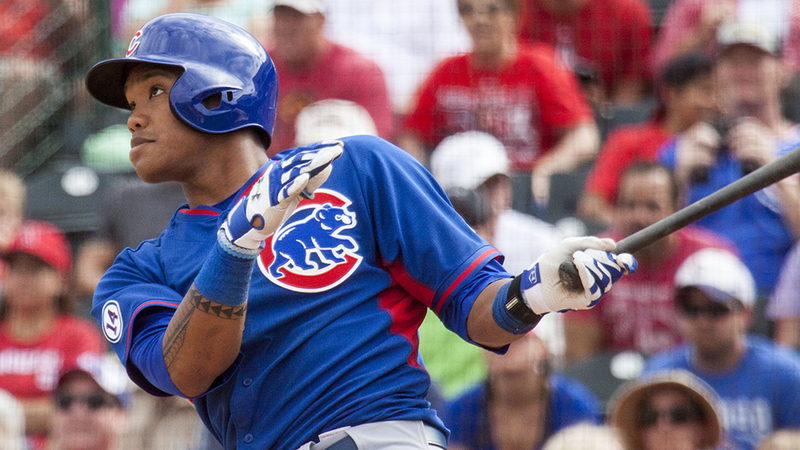 2 Cubs' prospect answered the phone, Iowa manager Marty Pevey told him he was headed to Chicago. "I was just chilling in my hotel room getting ready for bed when Marty called me and told me I was moving up," the 21-year-old said. "I didn't have his number in my phone, so when I saw that somebody from Atlanta, Georgia was calling me at 10:30 I thought about not answering it. He asked me if I knew who it was and I said no. "Marty's a great guy and he basically said that this is 'the call,' man. After he told me it was him I had a pretty good idea, but I was holding my breath. He said, 'Congratulations. You're getting called up.' Once he told me, I was just surprised and excited." Russell, selected 11th overall in the 2012 Draft by Oakland, is hitting .318 with a homer and nine RBIs in 11 Pacific Coast League games with Triple-A Iowa this season. He has appeared in 244 career Minor League games in his four pro seasons, the penultimate of which saw him break up Scott Baker's perfect game bid earlier in the day. In the second game of the doubleheader, he collected a couple of doubles and a pair of RBIs. The first call MLB.com's No. 5 prospect made was to his family back home in Florida. "The first two times I called, my father had bad reception," Russell said about trying to phone father Wayne. "The anxiety just built up. He finally went somewhere where he had a good signal. I told him I had some good news. He asked what it was and I said I just got called up. "He was smiling ear to ear, I could tell by his voice. I talked to my mom and my sisters and they were all happy for me." While Russell was able to speak to his father, mother Milany and younger sisters Kailani, 18, and Maria, 13, his 10-year-old brother Tyson will have to wait until the morning to get a special phone call from his big brother. "It was late. He was in bed," Russell said. Traded to the Cubs in the six-player deal that sent pitcher Jeff Samardzija to Oakland on July 4, Russell said he can't wait to join his Major League teammates. One familiar face in the locker room at Wrigley Field will be top prospect Kris Bryant, who the Cubs promoted Friday. Arismendy Alcantara is expected to the optioned to Triple-A in a corresponding move, according to MLB.com. "I never expected to feel like this," said Russell, who had been living in a hotel in Iowa because his apartment wasn't ready. "It is a dream come true, but the hard work doesn't stop here, it only gets harder. I'm going to continue my strong work ethic and perfect my craft and help the Cubs win a lot of games." Ashley Marshall is a contributor to MiLB.com. Follow him on Twitter @AshMarshallMLB. This story was not subject to the approval of the National Association of Professional Baseball Leagues or its clubs.